There can be a lot of power in stories about addiction: the power to dishearten, the power to frustrate, and (on rare occasions) the power to uplift. Regardless of the substance at the core of the disease, movies about addiction follow a familiar trajectory. If they're honest, they will take the viewer along on a downward spiral that has only two possible outcomes: death or recovery. Cinematic examinations of addiction aren't rare but well-crafted, emotionally potent ones are. Many of these films fall prey either to overt manipulation or a dispassionate, distant perspective. 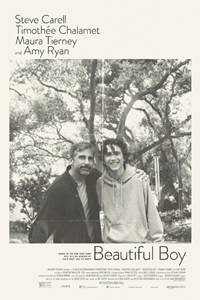 Beautiful Boy, from Belgian director Felix Van Groeningen and based on the memoirs of father-and-son David and Nic Sheff, skews close to the latter. Although the movie features strong performances and contains some individually potent scenes, the film's style keeps the viewer at arm's length, limiting the story's overall power and emotional resonance. Beautiful Boy tells the tale of the addiction of teenager Nic Sheff (Timothee Chalamet) from two perspectives: his and that of his father, David (Steve Carell). Using a tortured, sometimes confusing chronology that employs layered flashbacks and occasionally leaves the viewer bewildered as to what stage of Nic's problems we're watching, Van Groeningen keeps us intellectually engaged but emotionally disconnected. We expend so much mental energy rearranging scenes so they fit together that we lose sight of the people. Putting aside the snippets from Nic's childhood, the movie covers about 2 ½ years. The ending, unfortunately, echoes the kind of thing we would expect from a PSA. The movie jumps into the deep end, so to speak. When we first meet Nic, he's already well into the throes of addiction and, in all but the innermost nesting of the flashbacks, he is at least experimenting with drugs. His father is dimly aware that he's trying things (and even shares a joint with him at one point before using cocaine on his own in a strange scene without a follow-up) but is unconcerned. Eventually, however, both Nic and David are forced to confront what has happened. A rehab stint that initially appears to be going well, leads to a setback. This is followed by a cycle of binges and abstinence. The breakthrough seems to come when Nic moves from San Francisco to Los Angeles to live with his mother, Vicki (Amy Ryan). He's 14 months sober when he returns to visit his father, stepmother Karen (Maura Tierney), and half-siblings Jasper (Christian Convery) and Daisy (Oakley Bull). The experience proves to be too much for Nic and he doesn't make it back to Los Angeles in the same state he left. Taken in isolation, various scenes have potency. This is primarily due to the performances of Steve Carell (who has completed the transition from comedian to primarily dramatic actor) and Timothee Chalamet (Call Me By Your Name). Whatever faults Beautiful Boy has, acting isn't among them. Carell offers a sympathetic and at times moving portrait of a father desperate to understand what has happened to his son yet unable to cope with it up close. When confronted with his son's dependency, his frustration manifests itself in anger. (Families and friends of addicts will be all-too-familiar with this.) Chalamet's nuanced portrayal covers all the bases: delerium, despair, depression, determination, desperation. The film's women, Maura Tierney and Amy Ryan, aren't given more to do than be supportive - that is until Tierney becomes involved in a car chase late in the proceedings. That's right - there's a car chase in a grounded drama. Whether or not that happened in real life, it's contrived in this context. Two kinds of movies almost always get to me, tearing at my soul and rending my heart: stories of fathers and sons and tales of people struggling against their demons. Beautiful Boy is both yet, because of the way screenwriter Luke Davies and Van Groeningen have framed and presented this one, it didn't penetrate deeply enough to leave a lasting impression. Exiting the theater, I was aware that the experience should have been sharper. It should have brought me to my knees. It didn't. Although it would be unfair to lambast a competently filmed and well-acted production, neither can I join the chorus of those praising its Oscar-worthiness. Beautiful Boy delivers less than what one would expect from the story it endeavors to tell.